Philip Hamburger is the Maurice and Hilda Friedman Professor of Law at Columbia Law School and the author, most recently, of Is Administrative Law Unlawful? Professor Hamburger argues that administrative law is unlawful, unconstitutional and illegitimate. Drawing on English legal history, he contends that the regime of agency government resurrects the prerogative power once claimed by English kings and places it in the executive branch of the United States government. The history makes clear that this is exactly what our Constitution was carefully designed to prevent. It is the most important book I have read in a long time. Over the past few days we have accordingly run a series of posts on it. Here, with Profesor Hamburger’s indulgence, I try to play the role of C-SPAN founding genius Brian Lamb and ask the questions an intelligent reader would want answered. Power Line: How long did you work on the book? Power Line: What interested you in the subject? Philip Hamburger: Extralegal power is the central constitutional question of our time. Power Line: What is the nature of the research you conducted to write the book? Philip Hamburger: The research was very satisfying, for it took me across the full history of constitutional struggles, from the Middle Ages to the present. The English research included the medieval due process statutes, and the attempts of Henry VIII and James I to rule through the Star Chamber and High Commission, and the constitutional battle to limit the extralegal power. This involved reading old statutes, Parliamentary debates, and reading printed and manuscript writings on the prerogative. The research then took me into American history, from the founding era onward. This American research included a study of the Treasury’s circular letters, instructions, and regulations in the Archives in Maryland, and an attempt to identify all federal licensing schemes up to the twentieth century. I also looked at a wide range of nineteenth-century health, police, and other regulations. Ultimately, the work led to Continental law. Extralegal power has long been justified by academics, beginning with those who worked in the Roman civil law tradition that flourishes on the Continent. It therefore became necessary to study how civilian academics helped to establish extralegal power there, especially in Prussia and other early German states, and how Americans learned about administrative power, from German legal theorists and even learned from them to have contempt for the separation of powers. But my work just scratches the surface. There remains much important work to be done, especially on the Continental developments and on nineteenth and twentieth century American administrative power. Power Line: You argue that administrative law is outside the law, above the law and consolidated in violation of the law (the Constitution). What do you mean? Philip Hamburger: Administrative power is extralegal, or outside the law, in the sense that it attempts to bind Americans not through law, but through other mechanisms. The traditional common law ideal, secured in the Constitution, is that government can bind its subjects only through the law–meaning only through legislative acts and acts of the courts of law. In contrast, in the absolutist traditions of the civil law, the government can bind subjects through other, prerogative or administrative edicts. This is not government through law, but extralegal power that runs outside the law. Administrative power is surpralegal, or above the law, in the same sense that absolute prerogative power was above the law. King James I demanded that the judges defer to the acts of his prerogative courts, including their interpretations of statutes, on the theory that the king’s absolute prerogative was above the law. Similarly, nowadays, the judges defer to administrative power, including administrative interpretations of statutes, and although they no longer say that they thereby are treating administrative power as above the law, this is, in effect, what they again are doing. Power Line: Does English legal history provide an analogue or antecedent for administrative law? Is this a case of eternal recurrence? Philip Hamburger: Sadly, administrative power is not just a modern development. Instead, it appears to be a recurring phenomenon–a part of the long standing tension between absolute power and government through law. Repeatedly over the past thousand years, rulers have attempted to exercise binding power, legislative and judicial, not merely in a regular manner through the law and the courts of law, but also irregularly, through prerogative or administrative commands. Magna Charta already took a stand against this sort of power. The 1354 and 1368 due process statutes even more emphatically barred it. But English kings persisted in exercising extralegal power until, in the seventeenth century, the English adopted constitutional ideas to put an end to this danger. Similarly, American constitutions barred extralegal power. Nonetheless, it has come to back to life. The tendency toward extralegal power thus seems to arise not from the nature of modern society, but from the nature of human beings, who always seek more power, if not through law, then outside the law. Power Line: As you note in the book, in Federalist 47 Madison condemns the consolidation of executive, legislative and judicial power in one hand as the very definition of tyranny. Doesn’t this perfectly describe the regime of administrative law? Philip Hamburger: Unfortunately, administrative power does combine executive, legislative, and judicial powers, but whether it amounts to tyranny in a simple sense is another matter. As Tocqueville recognized, administrative power consolidates the powers of government in a way that, at least initially, creates only a soft tyranny. Of course, this sort of consolidated power eventually accustoms the people to being ruled. It turns them from free people into a people anxious for Ordnung, and this is what happened to the Germans between the sixteenth and the twentieth centuries. Too many of them became what Max Weber called Ordnungsmenschen. Power Line: You don’t address particular administrative agencies or regulations or proceedings in your book. Would you apply your thesis to current examples of the administrative state in action (for example, the EPA, the IRS, Obamacare, waivers and so on)? Philip Hamburger: Almost all government agencies, ranging from the IRS to the FDA, attempt to bind Americans through administrative rules and adjudications–that is, not through law, but through extralegal edicts. Power Line: Your book was obviously written over a period of years, but some of it feels like it comes out of today’s headlines. How does the issue of executive waivers or executive rewriting of Obamacare requirements illustrate your thesis? Philip Hamnburger: The waivers issued during the past several years have been astonishing. They reveal that aspects of seventeenth-century England have come back to life, and this is deeply disquieting. As a practical matter, waivers are simply private letters, from executive officers, purporting to relieve the recipients of the obligation of the law. It is difficult to think of anything more lawless. Power Line: It seems to me that your chapter on congressional delegation of legislative authority is a pillar of your argument. You argue that the Constitution prohibits the delegation of its authority to the executive branch. Will you briefly restate your argument on this point? Is this argument an essential component of your case against administrative law? Philip Hamburger: Delegation is one of the standard excuses for administrative power. But it often fails even on its own terms. One problem is that delegation usually is only a theoretical justification, not a realistic one in practice, for much administrative power does not have authority from Congress. Agencies frequently strain their powers beyond their delegated authority, and thus, even if delegation really could justify administrative power, it often does not justify it in particular instances. A second problem is that, even if Congress could delegate its own legislative power, how could it delegate judicial power, a power that does not even belong to Congress? The legislature cannot delegate a power it does not have. More generally, even where there is delegation, it is a poor excuse for administrative power. First of all, delegation is not as central a point as often assumed, because even if administrative lawmaking is delegated by Congress, it remains an attempt to bind Americans through rules that are not laws, and it thus remains extralegal power. In addition, what apologists for administrative power call “delegation” is really subdelegation. Delegation is what the people do, for the people delegate legislative, executive, and judicial powers to different parts of the government. The next stage is when Congress gives this power to administrative agencies, and this therefore is subdelegation. The principle of delegation, however, has long been recognized to preclude subdelegation where the initial delegation of power is to bodies chosen for their particular qualities. In the Constitution, the people delegate legislative powers to a Congress structured for legislative purposes and the members of which are chosen by the people for their personal qualities. The initial delegation by the people therefore precludes any subdelegation by Congress. The initial word is revealing. If the goal were merely a permissive delegation of legislative powers to Congress, so that Congress could subdelegate the legislative powers, the Constitution could have simply stated that “the legislative powers herein granted shall be vested in a Congress.” Instead, the Constitution stated all legislative powers. If all legislative powers are in Congress, they cannot be elsewhere. Power Line: You contrast Congress’s delegation of legislative authority with Congress’s inability to transfer judicial duties outside the judicial branch. You also recount the legal history regarding the nontransferable nature of the judge’s office. Does Congress have greater power to delegate its legislative authority than it might over another branch’s power? If Congress can delegate its legislative authority, why can’t the judicial branch delegate the judicial power? Philip Hamburger: Congress at least has legislative powers, and it therefore is at least open to debate whether Congress can delegate them. In contrast, Congress does not have the judicial power, and Congress cannot delegate a power it does not have. Nor can the courts delegate their judicial power, for at common law it long has been recognized that judges are chosen for their personal qualities and that they therefore cannot subdelegate their office and power of judgment. In the civil law tradition, it was expected that judges would subdelegate their judicial power, but in the common law tradition, when a constitution authorized courts and judges, it was taken for granted that this meant that the judges themselves would exercise judicial power, and that they could not delegate their office of judgment. Power Line: It seems to me that you don’t propose much in the way of a solution to the problem of administrative law — not that there is anything wrong with that. To ask the Leninist question, however, what is to be done? 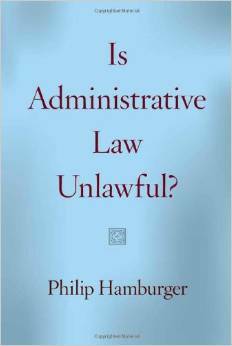 Philip Hamburger: The first step is simply to understand administrative power–to recognize that it is extralegal and absolute power. Once this is understood, the rest will follow. This is why I wrote my book and why I close with a plea for more accurate language about administrative power. Rather that clothe it with the legitimizing vocabulary of the law, one should describe it in candid terms that recognize its extralegal character. For example, rather than call it “administrative law,” one should call it “extralegal power.” Rather than call administrative adjudicators “judges,” one should call them “executive officers who are stepping outside the bounds of executive authority.” And so forth. Power Line: Professor Hamburger, we thank you for your indulgence and wish you great success in your mission with the book.